Description: SCP-325 is a small bottle of ██████ brand washing detergent, a product commonly sold in the United Kingdom. However, the "█████ █████ █████!" 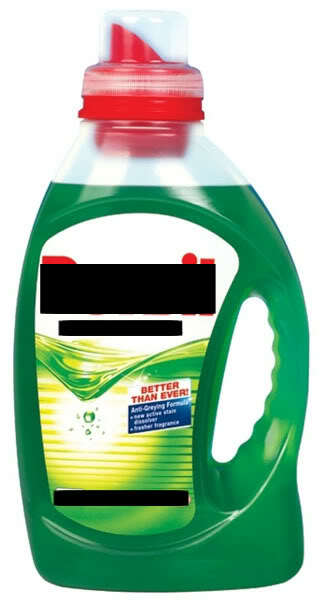 name present on the label does not match any of the ████████ company's current products. SCP-325 contains a semi-viscous green liquid, identical in chemical composition to the "Naturals" range of washing detergent sold by ████████. SCP-325 is a "Value pack" container of concentrated detergent, and currently contains 1,775 millilitres of fluid. One (1) wash of SCP-325 requires 25 ml of liquid, as indicated on the instructions located on the rear of the bottle. This information also contains a warning detailing [REDACTED]. Level 2 Behaviour Subjects exposed to SCP-325 for between 24 and 96 hours will begin to display extreme mysophobia and manic washing regimens. Exposed subjects will also shun others, only exiting their domicile to stockpile supplies of tinned food and cleaning agents such as bleach. Interviews have shown that subjects view the outside world to be 'unclean'. Level 5 Behaviour Once a subject has been exposed for 480 hours they will proceed to [DATA EXPUNGED - SEE REPORT 325-E1] which resulted in the deaths of ██ civilians and █ Foundation staff. This event is detailed on the warning on SCP-325's label; a copy is available to researchers above Level 3 clearance.